Cao Fei’s video installation is only twenty-one minutes long. It is shot in the OSRAM lighting factory in Foshan (Pearl River Delta, China) over a decade ago. OSRAM, a German company, is one of the largest light bulb manufacturers in the world. Cao Fei’s film is in three parts. The first part – Imagination of Product – is a delightful journey into the creation of a light bulb. The bulb is created by machines in a fragile dance movement. There are no workers in sight. The second part of the video – Factory Fairytale – follows the antics of the workers, who dance and play guitars inside the factory. Most of them are dressed in the uniforms of the workers, but one is wearing a ballet outfit. The third section of the film – My Future Is Not a Dream – has workers looking at the camera as the factory works at full tilt. The workers stand with t-shirts that spell out My Future Is Not a Dream. The OSRAM factory over ten years ago used machines to produce lightbulbs for the Chinese and international markets. The factory relied upon a skilled workforce – the small number of workers on this factory floor part of the over 700 million Chinese workers that work across the vast landscape of modern China. It used to be that China’s comparative advantage was the suppressed wages of its workers, although that has begun to shift with an average increase of wages (and a rise of inequality, which messes up the averages). What is so charming about Cao Fei’s film is that she asks the workers to do what they like to do, and what they like to do is to dance, play music and sing. In other words, the workers like to dream. The last phrase is enigmatic. Is the future that the workers anticipate already present? China’s economy remains closely tied to that of the United States of America. The US is by far China’s largest trade partner, with Chinese goods swamping the US from one coast to the other. Profits made by China through this trade are then invested in US Treasury bonds and in US markets, allowing US banks to lend money to the US population, which has seen wage rates remain flat for decades. The US population then uses this credit to buy Chinese goods. It is a satanic cycle. Donald Trump’s trade war is merely, as Prabhat Patnaik points out, one episode in the ‘prolonged and serious crisis’ of capitalism. Trump is fighting to squeeze China, to make China give the United States access to sections of the Chinese economy protected by the state. He has no plan to solve the crisis of capitalism. That is not his agenda. His is the old dream – a dream that goes back to the late 19th century, when the United States used the hammer of the ‘open door policy’ to enter the Chinese market (US traders at that time included the Astors and the Forbes – now storied names, but then opium dealers). The mutual rise of tariffs on US and Chinese exports are not intended as an economic instrument as much as a political one. Trump knows that the United States can place more tariffs on Chinese goods, because China exports more goods to the US than the US exports to China. That has already become evident. There is already the threat on the table, however, that the Chinese might stop buying up US debt (and Treasury Bills), which would put pressure on US interest rates and stifle economic activity inside the United States. But, with China’s large dollar holdings, this would impact the Chinese reserves negatively. China is playing a long game. It is building two new bridges as the US-China bridge weakens. It has used its vast reserves to build a massive infrastructural project along Asia – the Belt and Road Initiative (there is a parallel security strategy across the Indian Ocean – String of Pearls). This will link the Chinese economy outwards to West Asia and through Turkey into Europe. It will also draw in Central Asia and Western China. 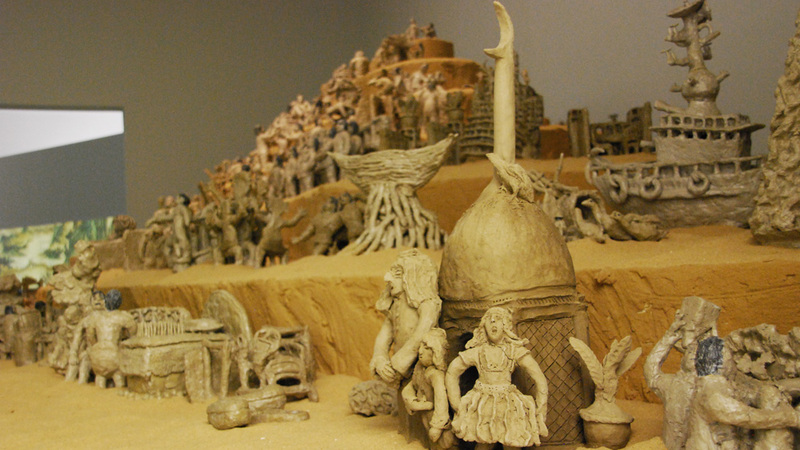 Hu Zhijun’s little sculptures, which were on display at Qatar Museum (below), are a little testament to the cultural medley along the old Silk Road, along which now runs a train line from Bayannur (China’s Inner Mongolian Autonomous Region) to Tehran. The second bridge is into the continents of Africa and South America, where Chinese investment is the entry point for integration of the markets on those continents with Chinese goods and services. One important development is the arrival of the Confucius Institutes in these regions, spreading Mandarin and Chinese culture. There are now about fifty Confucius Institutes on the African continent, when there were none in 2004. It is curious that Western periodicals complain about Chinese colonialism – periodicals which said nothing against Western colonialism at its high point (the Financial Times, founded in 1888, took its first ‘anti-colonial’ stand against Chinese investment in Africa, but said nothing of British colonialism at its high point). Chinese firms in Africa are not there for humanitarian purposes, but neither are they there for colonialism. They are there to do business. They face an inter-capitalist rivalry with Western firms, which – unused to competition – have termed China’s entry as colonialism. Why is China a threat to Western firms in the African continent? The Human Development Report of 2013 had the answer: ‘China is providing preferential loans and setting up training programmes to modernize the garment and textile sectors in African countries. China has encouraged its mature industries such as leather to move closer to the supply chain in Africa and its modern firms in telecommunications, pharmaceuticals, electronics and construction to enter joint ventures with African businesses’. Business leads the way. A recent paper by the IMF suggests that while China has come close to abolishing poverty, spiralling inequality rates have been a crucial setback. According to World Bank figures, 67% of the Chinese population in 1990 lived below the poverty line, whereas by 2014 the figure dropped to 1.4%. The Chinese government has used its considerable national treasure to finance anti-poverty measures – 1.2 trillion yuan this year – and to tackle the disparity of income along two axes, rural-urban and coastline-interior. On the Left there is a decades-long debate about how to characterise China – is it still a socialist country, has it restored capitalism? These broad statements tend to come without enough of an understanding of the complex and rich developments ongoing inside China and by China around the world. Recorded strikes in China’s factories have increased astronomically – from 200 in 2011 to 1,256 in 2017. Workers have been demanding that they be paid what they have been promised and that they have the basic right of forming unions. A study by the China Labour Bulletin shows that strikes have declined in the labour-intensive manufacturing sector and have increased in the services and retail sector. These are typically demonstrations in the name of the Chinese Revolution not protests against it. They contest capitalist norms and demand socialism. They are dancing in their factories, dreaming of lives to be lived not lightbulbs to be built.